Thank you to everyone who linked up last week. Conversations with Hank shared a reflection about birthdays and Le Coin de Mel shared a family update. I loved Wriggly’s mispronunciation of echoes (“geckos”) and Beanie’s description of a spicy chorizo being like a city burning down in your mouth. I quite often get a bit of a commentary from the back when we’re driving somewhere – although not usually in song form. Normally one of the girls will be telling me off if I’ve stopped – “Mummy, why aren’t you moving?” They don’t seem to understand sometimes that I can’t wave a magic wand and make the traffic in front of me disappear or make a red light turn green any quicker! Sometimes I’ll also get a “Mummy, you’re going the wrong way!” if I decide to take a different route to a known destination. 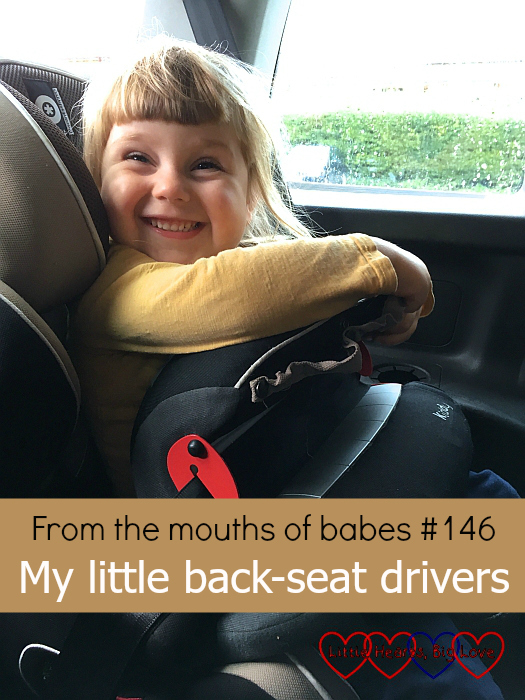 If I have the sat nav on, occasionally I’ll also hear a “Hello Tom-Tom!” shouted from one of the back seats. Thankfully the Tom-Tom rarely seems to pick on the girls’ attempts to use voice activation!